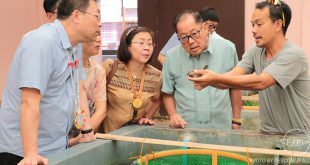 To secure a sustainable fish supply for the country, Philippine Technical and Administrative Committee (PTAC) members requested SEAFDEC/AQD to put all aquaculture research and development plans into fruition. “The Philippines’ aquaculture industry needs to improve aggressively and we wish for SEAFDEC/AQD to put all future plans into action,” Director Eduardo Gongona of the Bureau of Fisheries and Aquatic Resources said during the 27th PTAC Meeting last 17 October 2018 in Makati City, Philippines. The PTAC is tasked to coordinate between SEAFDEC/AQD and the Philippine Government as host and is comprised of representatives from relevant government agencies. Director Gongona, in his capacity as PTAC chair, highlighted the importance of aquaculture research and development as it can solve the country’s major concerns including food security and, even, decongestion of urban areas. “Through enhanced aquaculture technologies, the government can encourage the urban poor to transfer to the rural areas with the option of better source of livelihood and income,” Director Gongona said. PTAC members also suggested for SEAFDEC/AQD, together with its government partners, to improve the mechanism of converting field-tested studies into technologies that may be adopted by stakeholders. “We believe that research, especially those with great potential, should be converted into something tangible that can help the industry,” SEAFDEC/AQD chief Dan Baliao concurred while presenting SEAFDEC/AQD’s activities with an emphasis on technology transfer. 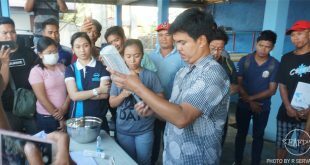 Chief Baliao revealed that stakeholders will soon benefit from the mass production of low-cost feeds for milkfish, a product of years of nutrition research at SEAFDEC/AQD. Through a proposed feed mill to be constructed at its Tigbauan site, SEAFDEC/AQD will be responsible for the mass production of formulated broodstock and grow-out milkfish feed which will be distributed to BFAR demonstration centers and facilities all over the country. Baliao pointed out that the project was made possible through collaboration between SEAFDEC/AQD, BFAR, National Fisheries Research and Development Institute, and Bureau of Agricultural Research (BAR). 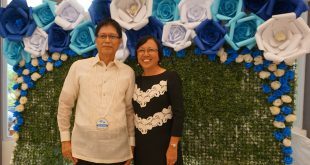 “This is the reason why we wish to work closely with BFAR because they have the facilities and the demonstration funds to verify the technologies,” he added. During the meeting with PTAC, Baliao and the rest of the SEAFDEC/AQD Executive Committee renewed their commitment to contribute to Philippine aquaculture through technology transfer and extension. PTAC reviewed SEAFDEC/AQD’s accomplishments and plans in terms of research and development, technology demonstration and extension, training and information, and administration and finance. At the end of the meeting, the department’s accomplishments in 2018 were noted and the plans for 2019, including the proposed budget for year 2020, were endorsed. 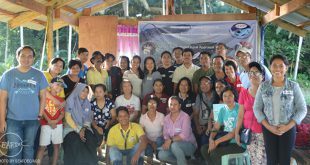 SEAFDEC Aquaculture Department and the Bureau of Fisheries and Aquatic Resources conducted an on-site training on freshwater aquaculture in Kabacan, Cotabato last 25-28 February 2019.